How to Pay HSBC, Citibank and other Non-BPI Credit Cards Through BPI Express Online? I recently retired my Unionbank account which has been my only online method of paying my HSBC and Citibank credit card bills. So, I thought like I have no other way of paying my credit cards dept except going to the bank itself. But the thing here is: there's only one branch for the two banks I mentioned earlier here in Cebu. And with the worsening traffic condition especially this holiday season, it could take a long time traveling just to pay my debts. The good thing though is that I found out that I can pay my HSBC and Citibank credit cards via BPI Express Online. But unlike other merchants, you need to take extra steps to enable this capability. And by the way, this is true even to other non-BPI credit cards and loan providers. So here's the steps you need to take to enable it. 1. Check if your credit card can be paid with Express Online. If you notice in the last column to the right, you see note saying "signed enrollment form". 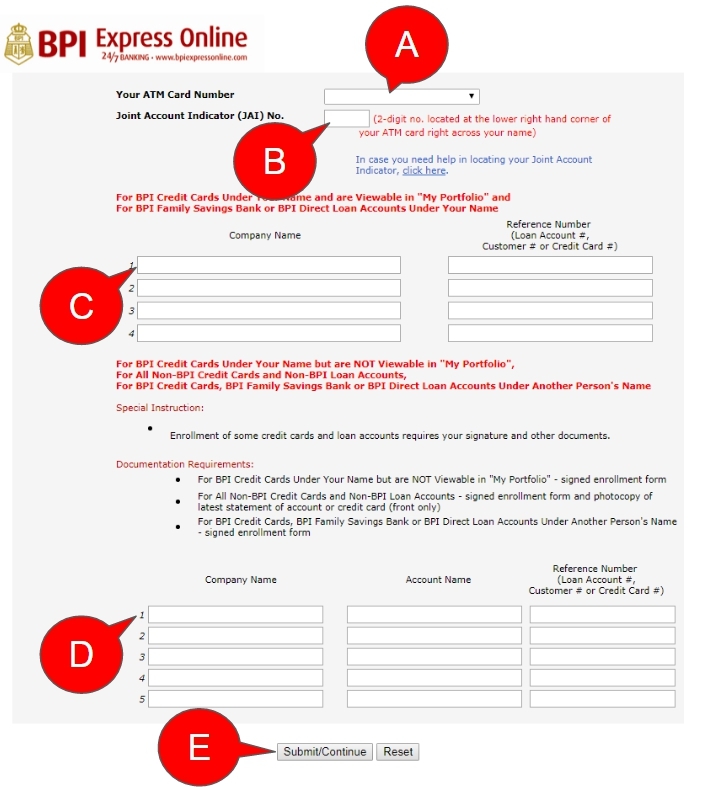 For non-BPI cards, you need to submit this document. The next step will show you how. Go to www.bpiexpressonline.com and login using your username and password. If you haven't enrolled your account yet, here's the link on how to do so. Now, go to the menu bar on top of the page and under the Payments and Reloading menu, look for Enroll Credit Cards or Loans. Here's a screenshot. 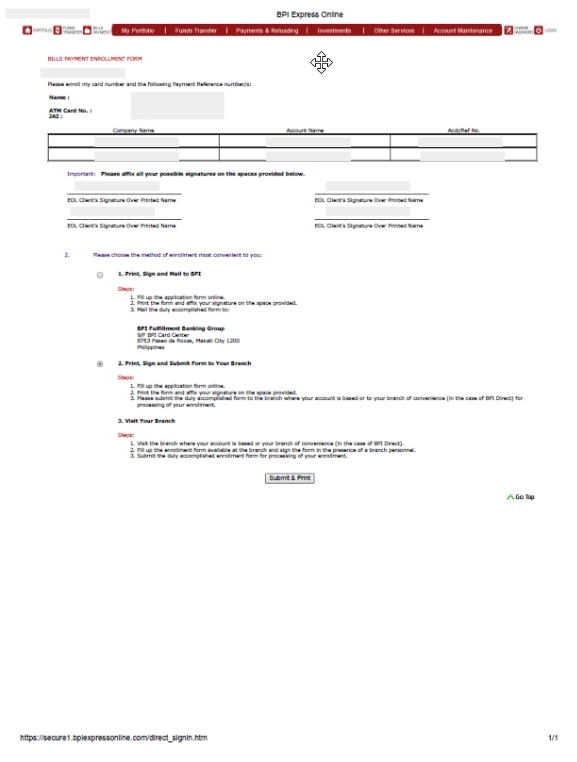 Upon selecting that, you will be presented with an online form. Fill it up accordingly. A. Choose the source of funds if you have multiple savings account. B. For joint accounts, check your ATM. If it says 01 or 02 next to your name. If it's not a joint account, key-in 01. C. DO NOT Fill This Up. This is exclusive for BPI Credit Cards which doesn't need a signed form to enroll. D. Here's where you input the Credit Card Provider. In the table above, copy the name in the first column. For example: HSBC Mastercard. Then input your account name as it appears in your credit card. And the last column requires the Credit Card Number. E. Make sure to hit the Submit button to proceed. 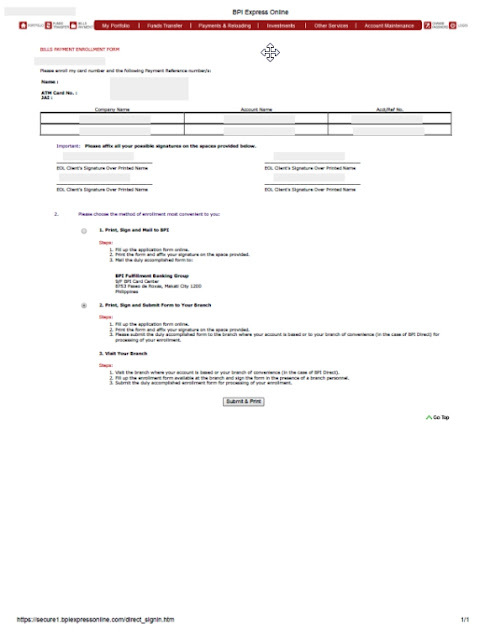 You will also be required to submit a photocopy of the front portion of your credit card along with the signed form. The last step is for you to wait. If you submitted the documents personally to you branch, it will only take 24 hours to activate the payment facility. But if you mail it, it will all depend when the documents reach BPI office in Makati City. So personally, I would rather choose to submit to BPI branch if possible. Now assuming that it's already activated. To pay your credit card bills after activation, just login to BPI Express Online, then go to Payments and Reloading, Bills Payment, Pay Bills Today. In the drop down menu, you will now see your newly activated credit card payment facility.